Nearly all of the Gainesville-area residents who died from flu this season didn’t have vaccinations. And flu shots may have prevented those illnesses, says the Gainesville Sun’s editorial board. A record number of school-age children in Alachua County were vaccinated last year, but the town’s huge population of college-age students also should be a priority for getting flu shots, the board said. The University of Florida’s Shands Hospital reported that 11 of the 12 patients who have died from flu since October were not vaccinated against influenza. A Brevard County woman has died and two other people in the county are in critical condition from the flu. The unidentified woman, who was in her mid-30s, died Sunday at Holmes Regional Medical Center in Melbourne, the Orlando Sentinel reports. Employees at All Children’s Hospital in St. Petersburg could be fired if they failed to get a flu shot last week, according to the Tampa Bay Times. Officials say patient safety is behind the policy. Only 20 employees have asked for an exemption. Veterans in Florida can now get a flu shot at any of more than 800 Walgreens locations and the drug store will electronically forward their immunization record to the VA. 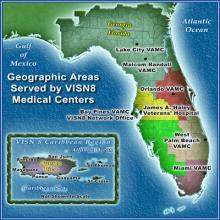 It's a pilot program being tried out in the Veterans Integrated Service Network 8 (VISN8) which includes all of Florida, southern Georgia, Puerto Rico and the U.S. Virgin Islands. It requires no paper record, no remembering at your next VA health care appointment.